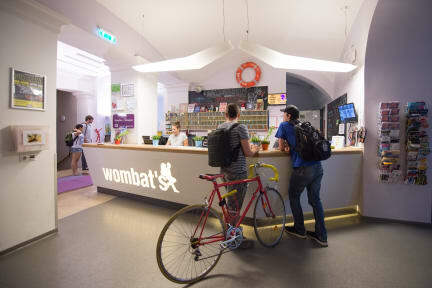 We like the very central location of Wombats City Hostel Budapest, just a block from Andrássy utca and five minutes from a metro station serving three lines going to Buda, the airport stop and the three main train stations. This friendly, clean hostel opened in 2012 in a former hotel. It features spacious ensuite rooms with free air conditioning, free welcome drinks for guests and a budget-friendly all-you-can-eat breakfast with yoghurt, fruit and good bread. The hostel is excellent, being in the very centre of the city. The breakfast available is great and at a very good price, so I would highly recommend that. The staff are friendly and helpful, and the reception being open 24 hours is especially useful if there are any problems. We really loved this hostel, it was so clean and well looked after and in a great location for sightseeing/public transport with metro and tram stops a 5min walk away. The staff were all really helpful and the bar/social area downstairs was a great place to hang out 😊 I would definitely stay there again if and when I come back to Budapest! This was such a great hostel and I had a brilliant stay! It’s very secure, with really big lockers provided in the rooms so you can keep all your stuff safe. The location is perfect and literally every single member of staff I spoke to was friendly and helpful. Facilities are excellent. I’d definitely recommend staying here! Big hostel in a central location close to tourist sites, restaurants, shops, bank, and metro. I stayed on 4th floor and noise from street (or hostel) was not noticeable at all. Room was spacious and had lockers opened with door key card. Hostel does require an ID card in exchange for key card. Had a good time with people from the room but was hollered at a bit by guys from bar downstairs. Ensuite bathroom also smelled very, very bad but was clean and I got used to it after a bit. Wombats is great for people who like to party and enjoy big "Hotal a like" places. The daily breakfast for 3 euros is very decent. However, I personally didn't enjoy the impersonal atmosphere as a solo traveler that much. Additionally the bathroom was quite dirty and smelly the whole time I spent there… I'd still recommend it though, because it's right in the heart of the jewish quarter and perfect for groups of friends travelling on a budget. Weird smell when you first walk in but it is in a good location and pretty clean. The bunk bed mattresses were comfortable but the bed frame was very shakey and didn’t feel sturdy. I survived the top bunk it moved a lot. The staff was very nice and upgraded our room when we first go there for no reason. It’s in a really good location. The location is perfect, in the city centre with everything nearby. The weak points: the entrance has a lot of toilets' smell, the mattress are really bad (I didn't sleep so well), the rooms are too hot with poor ventilation (it was suffocating), and in the room's toilet there isn't even hand soap (in the shower there was a soap dispenser but with just water ¿?) . I've stayed in other Wombats' hostels and had better conditions. The entrance smells like sewage, the staff barely seem Interested and the place has no vibe. Wouldn’t recommend it for a solo traveler as there is very little to encourage you to socialise. The doors to the rooms don’t shut very well so make sure you double check them before you go out, I nearly left mine open a few times and I would often walk past empty rooms that had doors wide open. Rooms are very clean and spacious and so are the bathrooms. So that’s one good thing. I think what's really unique about us is that this was a pretty good hotel before we upgraded it to a Wombats , so it comes with some amenities you don´t typically find in a hostel, like really big rooms, a/c, nice en suite facilities (even with hairdryers) and amply dimensioned common areas. It´s the biggest hostel in town, so guaranteed never boring. And the house is run by a really, really enthusiastic team. We're one block from Andrassy utca (Budapest's version of the Champs Elysse), the main cathedral is just around the corner and the history city centre is a ten-minute walk away. Walk in the other direction and you're in the middle of the most lively nightlife area. Personally I recommend hitting Corvintetö, a superb rooftop club not far away. The langos shop next to the entrance is ridiculously good (and cheap), too.